Business Insider/Hayley PetersonWhole Foods could reach tens of millions of new customers through a partnership with Kohl’s. Kohl’s is adding Aldi to as many as 10 of its locations as the department-store chain looks to drive more traffic to its big-box stores. If Whole Foods struck a similar deal with Kohl’s, it would expose the grocer to tens of millions of new customers and make it a bigger threat to companies like Kroger and Walmart, according to Barclays analysts. Kohl’s has about 1,100 stores and it has already cleared out space in as many as 300 of them for other retail partners. Kohl’s is adding the discount grocer Aldi to as many as 10 of its store this year in a pilot test, the company said Thursday. If Whole Foods struck a similar deal with Kohl’s involving its lower-cost chain of stores, 365 by Whole Foods Market, it could expose the grocery chain to tens of millions of new customers, turning it into an unstoppable threat. “A Whole Foods/Kohl’s relationship would introduce new customers to the Whole Foods concept and could meaningfully increase the number of households shopping at Whole Foods, which we currently estimate at 8 million – well below Kroger at 60 million and Walmart at 100 million,” Barclays analysts wrote in a research note published Friday. 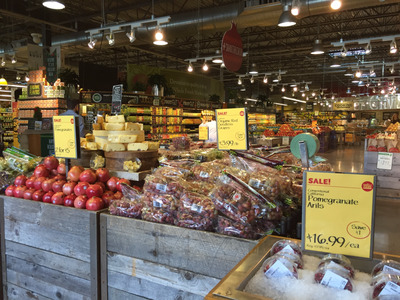 “Meanwhile, it would be vastly negative for the grocers – not only would Whole Foods be accelerating its unit growth but a partnership of this type would also be a clear signal it’s looking to broaden its base of shoppers,” the analysts added. Amazon-owned Whole Foods and Kohl’s haven’t said whether they are pursuing this kind of partnership, but the move would make sense for both companies. Kohl’s is already partnering with Amazon in another way. The retailer recently started selling its devices in stores and offering free returns for Amazon products at several locations. But the department-store chain wants to give even more floor space to other retailers – particularly food and convenience stores – to give customers more reasons to shop at its stores. The company has cleared out space in about 300 of its 1,100 stores for these partnerships. A partnership with Whole Foods like the one announced with Aldi would achieve this goal. Meanwhile, Whole Foods is trying to appeal to a broader array of customers through lower prices and potentially a wider array of consumer packaged goods like Coca-Cola. Moving into Kohl’s stores would give Whole Foods immediate access to the bargain-hunting customers that Kohl’s attracts. It would also give Whole Foods a lower-cost way to expand its 365 chain, since it would be moving into existing buildings rather than paying for new construction. It’s also important to note that Kohl’s offers some valuable real estate. Nine out of 10 Kohl’s stores are in suburban strip malls and other areas away from enclosed shopping malls, which have seen falling traffic in recent years. If Aldi instead strikes a deal for a broader rollout across Kohl’s, then it will pose a huge threat to traditional grocers.